Obviously if you are reading this post, you have probably had some sorta encounter with a psychopath, sociopath, or narcissist. A common feature of the psychopath is accusing others of the very thing the psychopath does (usually psycho's target, or person the psychopath feels is a threat, and could expose them) . Because psychopaths are excelled in lying. They can turn any situation into pure chaos, confusion and misery. Psychopaths will often create dissent by playing parties against each other. The psychopaths mind set is to DIVIDE AND CONQUER by presenting one person a completely different story, than they had previously presented to another person. Psychopaths are often very difficult or impossible to detect, because they present themselves as genuine and caring. Especially to a potential victim. Once they hook their victim, the mask comes off, and the psychopaths ugly comes out. They are abusive, condescending, manipulative, mean-spirited Tyrants! Since the psychopath doesn't want others to KNOW their True Nature and Malicious Intentions, they will rarely act out in front of anyone but the victim. So there is usually no other people around to view their sinister activities. If the victim speaks out against the psychopath, the psychopath is able to make the victim look like a liar, who is mentally unstable. This is a very defeating feeling for the victim. The victim is isolated by the psychopath. The psychopath works to isolate their victim(s) in order to keep them quiet. The psychopath especially works hard to keep previous victims and the current victim apart. So they are unable to put together the lies, abuse, and vindictivenes. 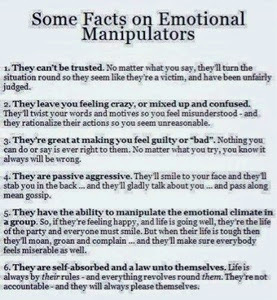 The variations that a psychopath will use on social manipulation are endless. The are professionals at this, they have been doing this to people all their life. Do not feel bad that you are unable to beat them at this game. It only means you are a genuine human being, with a kind soul. The psychopath lacks a soul, a heart, and any compassion. Having a soul is a beautiful thing. Underneath the psychopaths exterior is an ugly monster.